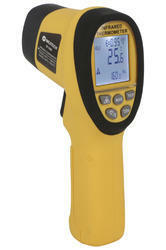 We provide quality range of infrared thermometers to our clients. These thermometers use in-built laser to sense infrared energy or thermal energy emitted by objects. 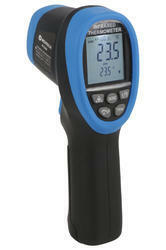 Hence, provide a convenient and easy way to infer temperature from distance without touching the object. 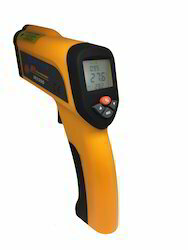 Our Infrared Thermometers are in high demand in applications like monitoring materials in process of heating and cooling, for research and development or manufacturing quality control situations. 10% To 90% RH Operating, <80% RH Storage. 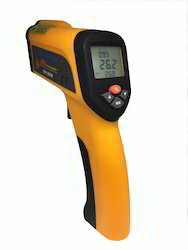 IR Thermometer Measure the surface Temperature of an object. The Units Optics Sense Emitted, Reflected & Transmitted Energy. Display : LCD Display With Back Light. · Alarm For High & Low Temperature. · “ MAX” , “MIN” & “AVG” Temperature. · Reading Hold OR Auto Power Off : Reading will Hold for 30 Seconds after releasing Trigger & after 30 Seconds Meter will Auto Turn Off.